THIS IS A PRE-APPROVED SHORT SALE!!!! HONEY STOP THE CAR! THAT’S RIGHT, YOUR SEARCH FOR THE PERFECT HOME IS OVER. THIS STUNNING DOMINION LAKES HOME HAS BEEN METICULOUSLY WELL KEPT AND FEATURES A WELCOMING OPEN FLOOR PLAN PERFECT FOR QUITE FAMILY TIME OR ENTERTAINING. ENJOY COUNTLESS UPDATES INCLUDING TOP OF THE LINE STAINLESS STEEL APPLIANCES AND A RECENTLY REPLACED HVAC. YOU’LL GET LOST WITH MULTIPLE ACCESS TO THE SECOND FLOOR WHERE YOU’LL FIND 4 SPACIOUS BEDROOMS INCLUDING A LARGE MASTER SUITE WITH A BREATH TAKING VIEW OF THE HALF ACRE GATED BACK YARD. THIS SHOW STOPPER WON’T LAST LONG. SCHEDULE YOUR PRIVATE TOUR TODAY! Ready to visit 1331 Dominion Lakes? Request a free property tour! Send me more information about the listing at 1331 Dominion Lakes, Chesapeake, VA 23320, MLS# 10175328. This 4 bedroom, 3 bathroom home located at 1331 Dominion Lakes, Chesapeake, VA 23320 has approximately 2,824 square feet. It is currently listed for $330,000 and has a price per sqft of $11,686. This home is currently Off Market under the MLS#: 10175328. 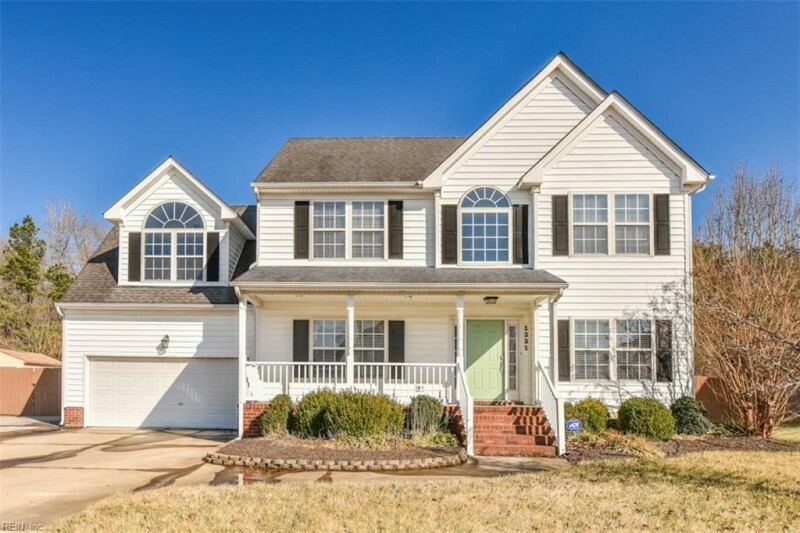 This listing is provided by Chantel Ray Real Estate Inc..
1331 Dominion Lakes Boulevard, Chesapeake was built in 2001. It has Garage Att 2 Car, 4 Space parking.The kitchen includes Dishwasher, Dryer Hookup, Microwave, Gas Range, Washer Hookup. 1331 Dominion Lakes is part of the All Others Area 32 neighborhood located in 23320.